The Berakah Players focus on intimate performances, working with Berakah’s back catalogue and re-imagining pieces to work in new settings. 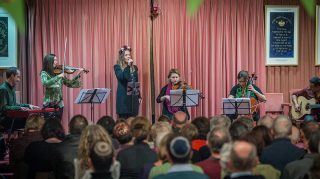 They’ve toured nationally and have performed sold out concerts in The Purcell Rooms on London’s South Bank as well as beautiful places of worship like St.Paul’s, Covent Garden. and are all professional working musicians and composers. The music they make brings together the various strands of not only their musical backgrounds but also their cultural and faith heritage. They have released two CD’s and in 2015 will debut new music which you can buy on CD via our shop and will soon be available for download. Join our mailing list for up to date details.